The new fermonster filled to capacity. Fermentation temperature is probably the bane of most every homebrewer. Unless you have a temperature controlled area or a jacketed mini conical then your beer can be subject to the temperature swings of the season. In our case here in Northern California that can be as much as 40° in the summer months. With huge swings like that maintaining a consistent temperature just isn’t possible. The most practical idea we came up with was to build a fermentation chamber. 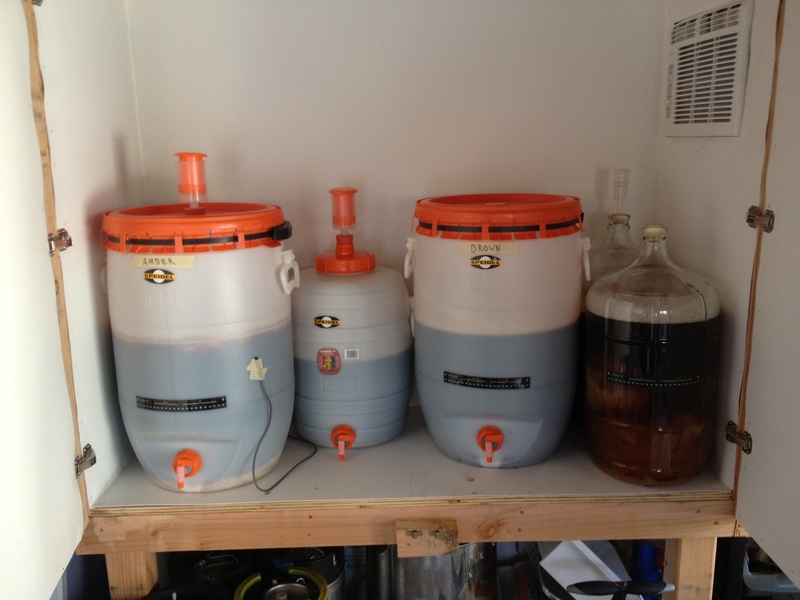 In our old place we had a couple of prebuilt shelves in the garage that we converted to a fermentation chamber. By slapping a couple pieces of plywood on either end and a little plexiglass on the front we created a great looking but nearly useless fermentation chamber. The first winter we used it we added a heater and it actually maintained decent temperatures but come summer no amount of ice would keep our fermentations in the right zone. So when we moved we decided that building an upgraded chamber that could maintain hot and cold was important and with that the Fermonster was born. 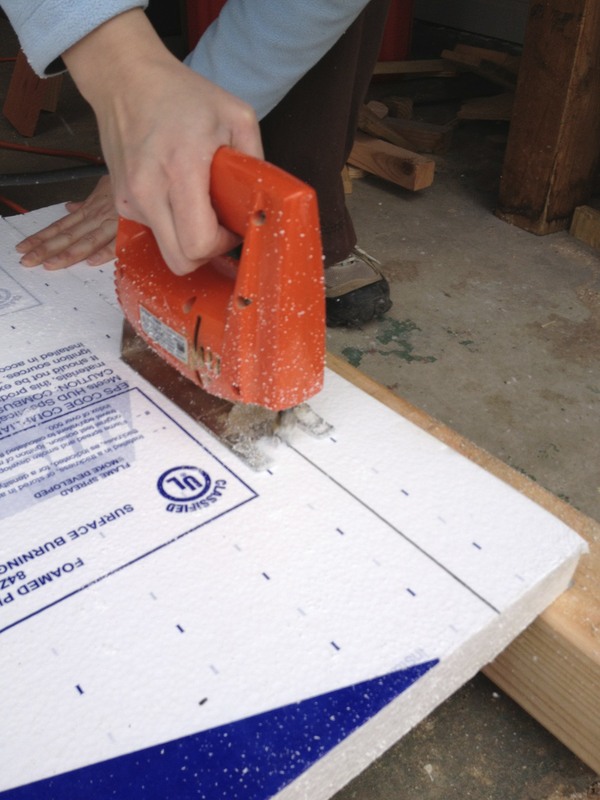 Who knew cutting insulation with a jigsaw was so much fun? We took the same basic idea for the new chamber but made it much more functional then good looking. We started this new design by filling every wall with 1.5″ of rigid foam insulation to trap the heating and cooling inside the box. We then added a dual stage temperature controller that connects to both a heater and an air conditioner that are both built into the unit. We also made sure that it would fit three Speidels inside which we decided would be the maximum amount of fermentation we would be doing at any time. After lots of cutting, drilling, caulking and maybe just a little bit of swearing and drinking our concept came to fruition. The box stands a bit over six feet tall and a bit under four feet wide. It has plenty of space for keeping empty kegs underneath and it the perfect height for lifting things in and out of. I am not entirely sure that it can be moved, but I am not entirely sure I ever will either so for now that works out. The end product has been outstanding. The Fermonster brings our fermentation to whatever temperatures we want quickly and maintains them there. 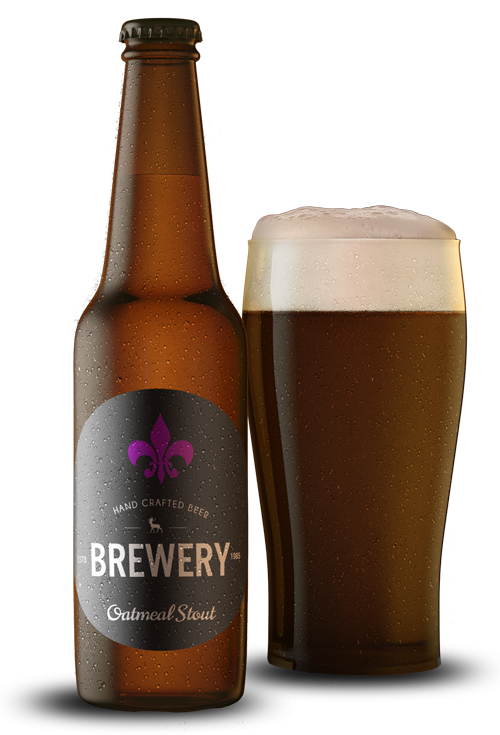 The most impressive part has been in the quality of our beer. I’ve gotten considerable feedback that our beers taste cleaner which I completely agree with. So now instead of fighting to maintain temperatures I can focus more on recipe creation and fine tuning our existing portfolio. The beginnings of the fermonster. Make sure that is straight. Inspecting the work so far. Sealing in the AC unit. We added a plastic for easy cleaning. The fermonster all buttoned up. The fermonster ready to go. We added some motion sensor lights. Great question. We are using a dual stage temperature controller that sets a different turn on temperature for both hot and cold. We have been keeping a two degree differential for each and it has been working great. So if our ideal temperature is 70° when the box gets to 72° the AC kicks on and brings it back down to 70° and if the box cools to 68° the heater kicks on and warms it to 70°. I have also been taping the temperature probe to the Spiedel (I would love to put it inside but I have not figured out a great way yet) so that it’s measuring the thermal mass of my fermentation more than the ambient air temperature. I would say with this system that we can control our fermentation to about a single degree which is not perfect but one hell of a step forward from where we used to be.